Exclusive to H. Samuel, this undeniably elegant deep brown leather strap watch is crafted with Swiss watchmaking expertise by Rotary. Styled with a fresh white multi function dial with silver tone sub dials and rose tone accents, along with date window between the 4 and 5 o'clock positions. Finished with a rich rose gold-plated stainless steel case. 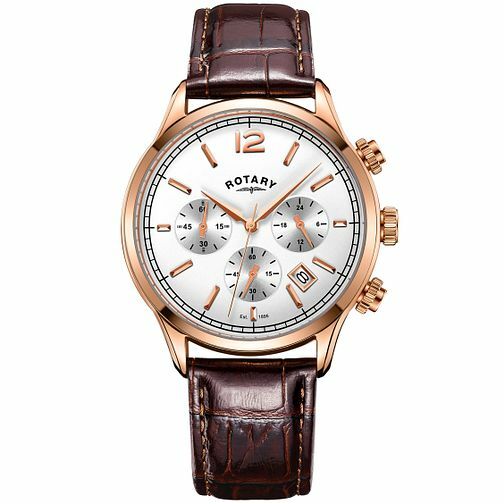 Rotary Men's White Multi Dial Brown Leather Strap Watch is rated 5.0 out of 5 by 5. Rated 5 out of 5 by Anonymous from This product is amazing! I bought this watch for my boyfriend as a birthday gift and he loved it! It has a great quality and it is beautiful too! I’ll recommend it multiple times! First, I didn’t know what to get him and I came across this product. It was on deal and the money spent on it was so worth it for such product!